An eGuide on how to turn your pile of paper receipts into an organized electronic filing system. 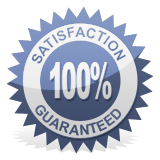 It's easy to have an audit proof set of records with this system. I became interested in paperless technology when I lived in a rural area which made the old fashioned pick up / drop off of bookkeeping packages and reporting tedious and inefficient. I was looking for a way to work from home without the long commute to town when I stumbled upon Brook's website that is all about organizing your piles of paper into an electronic filing system. He has plenty of guidance on how to go paperless. Brooks Duncan is a Vancouver based consultant with clients worldwide. He sometimes refers to himself as a geek but I'm here to tell you he speaks English too! I understand what he is saying while not being overwhelmed with "geek-speak". His paperless technolgy eBook will show you step-by-step how to organize files electronically using electronic document tools so you can move towards embracing a near paperless office ... you get choices ... who knew it isn't one size fits all! Brooks has a diverse background that touches upon accounting (he is a CPA-CMA), computer programming and client services. He has taken all of that expertise to produce an up-to-date top notch product that shows you how to convert a box of receipts into a paperless system your bookkeeper will love. I had the opportunity to interview Brooks Duncan. We discussed his system and how to get the most out of an electronic document filing (eFiling) system. I find his Paperless Document Organization Guide brilliant for technology challenged people like me. That's why I was delighted that Brooks Duncan was willing to chat with me about his eGuide. Warm up your tea cup and join our discussion about utilizing paperless technology and organization tools effectively. As a companion product, Brooks also published a guide to walk you through how to setup a ScanSnap receipt scanner. It really does get you up and running painlessly. For those with Macs, he also has a Hazel webinar showing you how to have your Mac name and file your documents for you. Brooks is devoted to helping individuals and small businesses go paperless by turning piles of paper into an organized, electronic system. Brooks, what do you do? I'm the Publisher of DocumentSnap.com, a website devoted to helping individuals and small businesses go paperless by turning piles of paper into an organized, electronic system. Why did you create a eGuide about how to use paperless technology tools and organize the e-documentation? By far the most common question I get from blog readers and subscribers to my Paper Cuts newsletter is "once I have scanned my documents, what do I do with them?". Since I was getting that question so much, I decided to put together an easy-to-follow guide to help people figure out what to do. Who is the Paperless Document Organization eGuide for? 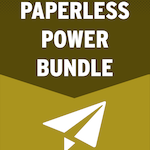 Someone who has started down the path of going paperless and is stuck, or is not sure where to start. An individual or small business owner who is tired of looking all over the Internet for bits and pieces of information, and would like to just have everything consolidated in one place. Many of my readers like doing everything themselves and messing around with crazy workflows. That's great, but this guide is probably not for them. It is for someone who just wants to get going. Learn whether you can shred your scanned receipts. Will your Paperless Document Organization eGuide help work from home business owners organize their bookkeeping receipts? Would bookkeepers be able to use this system to organize their client's e-records? Brooks' response: There is some material on dealing with receipts and client records. This is not specifically a bookkeeping guide, but I believe the concepts will apply. Laura's response: I've taken two of Brooks' classes and purchased all his guides. I find a lot of what he recommends work perfectly for setting up your bookkeeping receipt organization. His "maintenance routine" suggestions are excellent on how to keep up-to-date with your bookkeeping paperwork organization. How should small business owners use your eGuide to get the most from it? There is a Quick Start page at the front of the PDF portion, so I would recommend at the start just focusing in on the areas where the business owner has the most questions. I would also start with the workflow diagrams and the videos (at the Specialist level). Many people find it easier to see how things are done rather than read it in a document. Other than that, focus in on naming conventions and organization structure. Those are the biggies in my opinion. Go to downloading paperless statements procedures. How much time do you estimate it takes to setup a paperless bookkeeping filing system? It is difficult to put a number on it because it depends on whether a bookkeeper will just be using folders in the operating system, a piece of software, and which scanner he or she will be using. I recommend starting with a small test first to that you get the hang of the workflow, then expanding from there. That way the initial time is not too bad, maybe a few hours, and then any changes are incremental. I see you have a computer background. What level of computer skills or technical ability does a person need to follow your eGuide? I tried to keep the eGuide at a non-techie level as much as possible. The key concepts (naming, organization, finding) shouldn't take much computer skill at all. There are more technical areas (such as encryption, tagging, and the like) if people are into that, but I always advise people to ignore the stuff they are not ready for, and then come back to it on an as-needed basis. Take what you need and forget the rest. Learn how to create a paperless expense report. Thank you Brooks for talking about how your eGuide can help us utilize paperless technology and organization tools effectively and how to systematically create and organize a paperless document management system. Be sure to also check out Brook's receipt scanner guide The Unofficial ScanSnap Setup Guide. Read what Brooks has to say about sending sensitive financial documents by regular email. 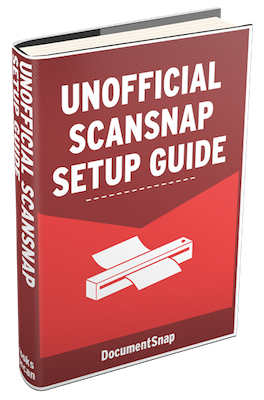 This Guide walks you through how to setup your Scansnap in plain English. There is absolutely NO NEED to wade through the hundreds of pages that comes with the Fijitsu scanner! The Guide is available for Windows or Mac platforms. The fifth edition was released in September 2016. All previous purchasers receive the new edition at no charge. If you missed receiving your revised edition, contact Brooks. This product comes with 60 day money back guarantee. Pricing starts at $10 USD. Click here for your no risk purchase.